One of my favourite Etsy stores of ALL TIME is Behind the Pages*. 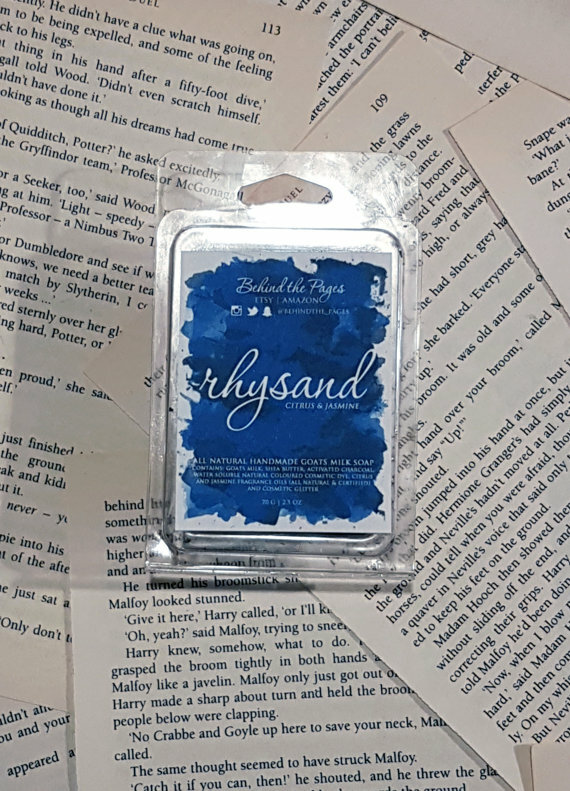 Gina makes amazingly delicious bookish themed soaps and lip balms, so today I wanted to share my thoughts on her Book Boyfriend range. *NB: the photos below are from the Behind the Pages Etsy store, as I used all of mine up and forgot to take some pics of their gorgeousness..Oops. I cannot stop spending ALL MY MONEY on these wonderful soaps and lip balms. As someone with sensitive/easily dried out skin, I found my skin stayed really soft and supple while I was using these products. The soap is made from goats milk soap, which means it is super great for sensitive skin, and feels beautiful to use. 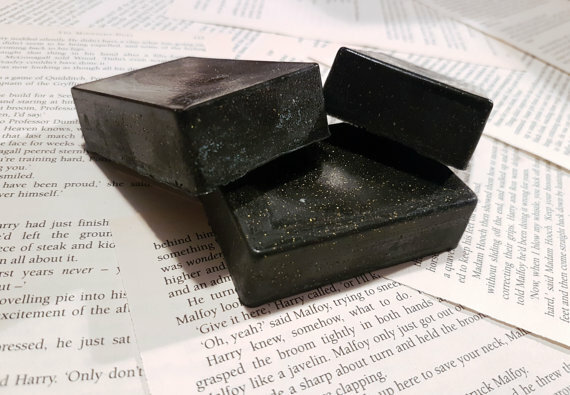 Rhysand: citrus and jasmine (a.k.a heaven scented). It’s black and has gold glitter and it is utter perfection!!! I will just say that you do need to hose the shower down afterward to get rid of any remaining black colour, but it’s definitely worth it. After using the Rhysand soap I kept finding pretty gold glitter all over me.. hehe, made me feel so PRETTY!! 2. 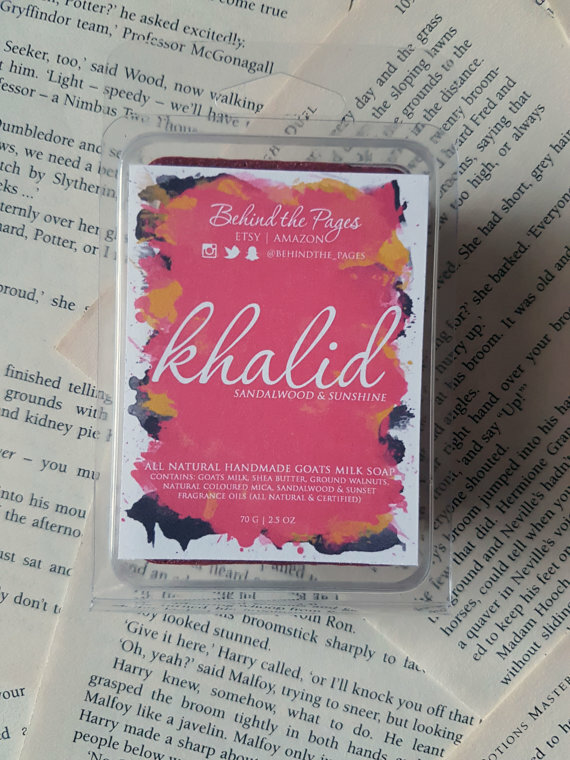 Khalid: sandalwood and sunshine scented (mmm, yum!). 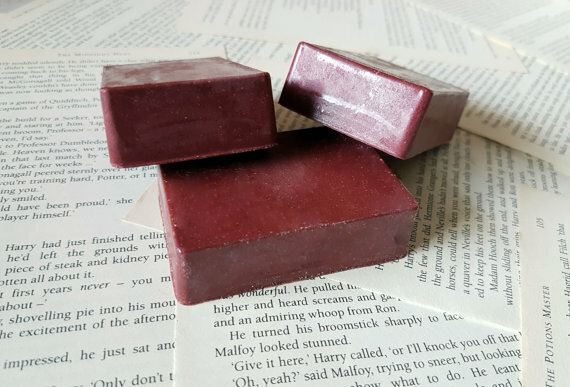 This delicious maroon coloured soap has crushed walnut shells in it, which feels fantastic on my skin, and has definitely helped keep it soft and supple over the past few weeks. I don’t love the scent as much as Rhysand (obviously! ), but it still smells delightful. 1. Rowan: smells like pine and snow (and perfect Fae God!!!). This lip balm has a subtle, delicious scent that I adore. It’s hard to explain exactly how it smells, but its easily my fave lip balm. It glides on, lasts ages and makes my lips feel silky smooth, and I find myself taking this lip balm with me everywhere I go. 2. Gansey: lime and mint scented, and is a super cute lime green colour. The lime scent definitely takes over with this lip balm, but its another super smooth, creamy balm which I love. It stays on for ages, and it seems to have a smoother texture than some of the other balms I’ve tried. With new Book Girlfriend themed goodies having been just released, I cannot wait to try even more of Gina’s amazing products. The easiest five star review I’ve ever had to give.